When the Bible says “Charity never faileth…” its talking about the virtue of always being charitible, not that there wont ever be derths of Charity. History is filled with deeds and ages of inhumanity. It ought to be obvious that true charity and compusory taxation are not the same thing. One gives in liberty from a heart felt love of humanity and a self imposed moral obligation to help his neigbour when they are in need, while the other is obliged to give ‘welfare’ via Government coersion… and not from the heart at all. Social welfare is not Christian charity. Welfare via coersion is actually an alternitive Anti-Christian system of ‘false alms’. Many Christians foolishly mistake Lefty communism for true Christian charity. “The process of converting social power into State power may perhaps be seen at its simplest in cases where the State’s intervention is directly competitive.” A Nock. The conversation was started when a fellow face booker posted an article that The Super City Council was considering making Auckland Ratepayers fork out for the building of a dry dock for the benefit of the super Rich mega yachts. He believes that would be misguided values and a gross injustice to use Ratepays money to build a dry dock for the wealthy and Better spent by government upon Drainage for a community sports ground. This may sound like a good proposition to many yet I think he is making a serious mistake, which is to assume it is a good thing for the Government to be involved in things ‘which Free enterprise has interest yet will be a direct benefit to all”. He is assuming that unless the Government steps up… things like the poor drainage of a sports field would never be resolved. 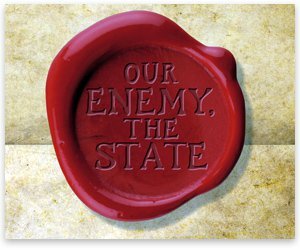 This is when Albert J Nock and his book Our Enemy, the State sprang to mind. “There is the mechanism of the voluntary association/ society by which the spirit of charity and social wellbeing is voluntarily organized in non-profit organizations. It is via these mechanisms that people may show their Humanitarianism without recourse to Political coercion or using the ‘filthy lucre’ of money Politicians have extorted from the people via Rates and taxes. B y leaving all such ‘projects’ to the voluntary sector and forbidding the Councils or Government from getting involved in such things we can rope in Government Medaling and better control their expenditure. This way we restrict their powers and spheres of operations to their proper duties, and set up the dynamics of society by which Non-political solutions to problems and needs are both understood and may prosper. Albert J Nock wrote on this important subject and showed that The more social responsibilities the state takes control of, the more the Self-reliant Social spirit of the community atrophies , and so becomes less able to fend for itself, and more dependent upon the state. This is the Process by which the people are rendered irresponsible and gullible worshippers of Nanny State because they assume all life’s problems have political solutions. We Libertarians seek to reverse this process and thereby increase society’s ability to look after itself in freedom, and reduce dependence and the costs, and spheres of operation of the state. It is a society in which voluntary associations flourish, and Government expenses bureaucracy are kept to a minimum. The Christian fellowship is a voluntary association. It preaches voluntary embraced values, voluntary action, voluntary charity, thus functions propery without political coersion. Christian virtue, self reliance, and Liberty are in harmony. More do than don’t it would seem. And unfortunately they make up a powerful lobbying block opposing any policy designed to shrink the welfare state. … which is why we need a Christian libertarian voice in New Zealand politics. The Communists started out in direct opposition to Christianity and the Church yet because that prevoked a powerful enemy, they changed tack, and instead infiltrated the Churches (And the universities, and other movements) and subverted them from the Inside. It is all documented. They twist the Bible and pretend ‘Jesus was a Communist’…etc. He was no such thing. Only Idiot sheeple dont know that Lefty Communism and Nannyism is not a direct challange to Christian ethics of Self responciblity, and God Given rights.